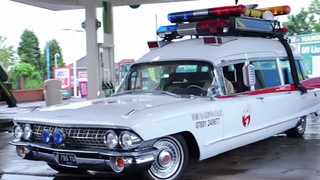 Now that’s a classy way to drive around the yard: in a perfect replica of the Ghostbusters Ecto-1. British enthusiast Paul Harborne spent three years and around $150,000 renovating his rare Cadillac Miller-Meteor and turning it into the iconic car. Must be fun to do a vehicle safety test with this particular car. But CatersTV’s video shows that an Ecto-1 makes an ordinary visit to a supermarket special.